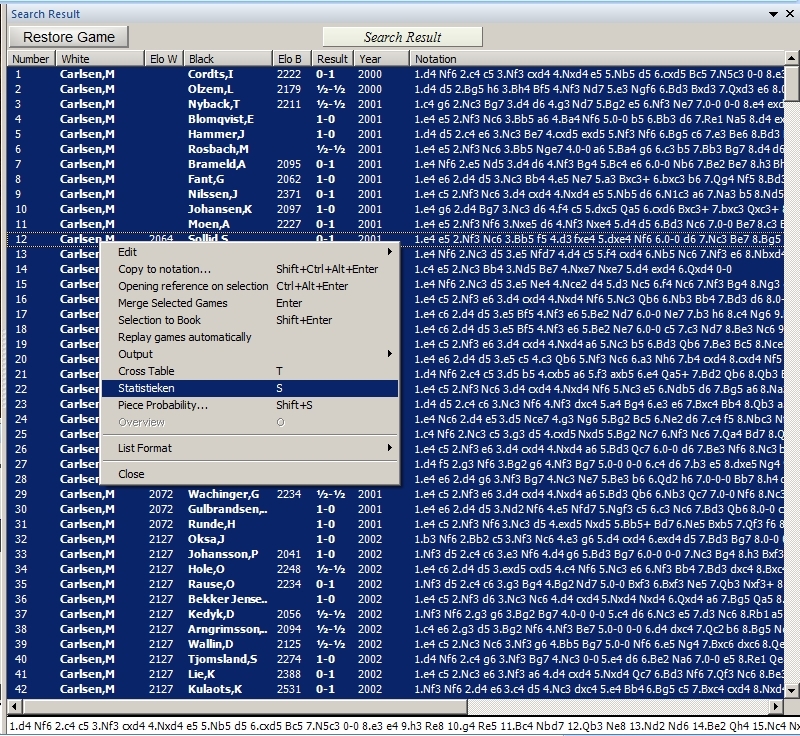 The ChessBase 11 chess database program makes it easy for users to pull up game statistics on their favorite players in just seconds. 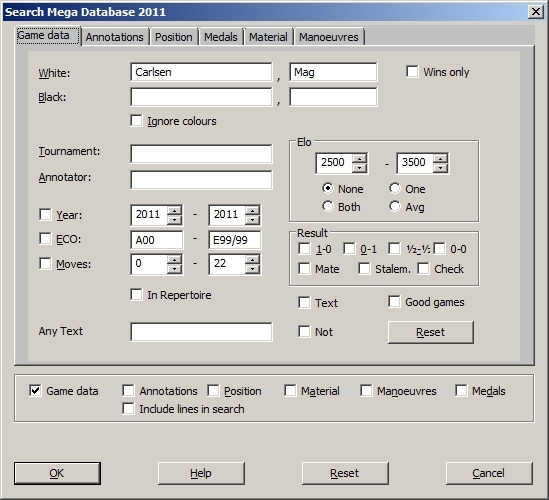 We’ll demonstrate this today by searching for Magnus Carlsen’s games and generating some statistical displays. I need to point out two things about this illustration. First, we want Magnus’s games as White only (for reasons which will be explained), so we’ll need to make sure that the box beside “Ignore colors” is unchecked. Second, we need to type “Mag” for his first name; if we type just the letter “M” we’ll also get the games of Morten Carlsen mixed into our search results. After clicking “OK” and waiting a moment or two, we’ll see the search results window showing Magnus Carlsen’s games in which he played the White pieces. Next we’ll single-click on the first game in the list (to highlight it, not open it in a new window). When we now hit CTRL-A on the keyboard, we’ll see that all of the games in the list become highlighted; they’ve all been selected. This is a visual statistical breakdown of Carlsen’s results with the White pieces. There are several components to this display. The first one to catch our eye (obviously) is the pie chart. This displays at a glance the relative proportion of Carlsen’s wins, losses, and draws; you’ll recall that this graph is based only on Carlsen’s games as White, so the light-colored area represents White wins (e.g. Carlsen’s victories), the dark gray area shows Black wins (e.g. Carlsen’s losses), and the medium gray area shows the relative proportion of drawn games. 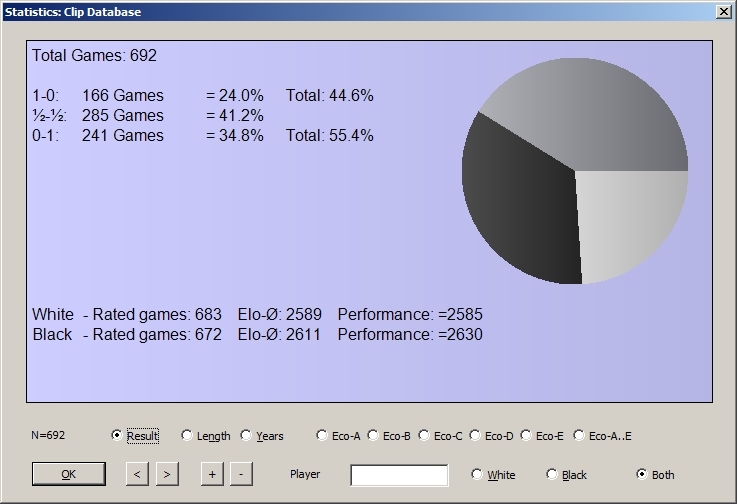 To the left we see the total number of games (in this case 719) and a numerical breakdown of the results. 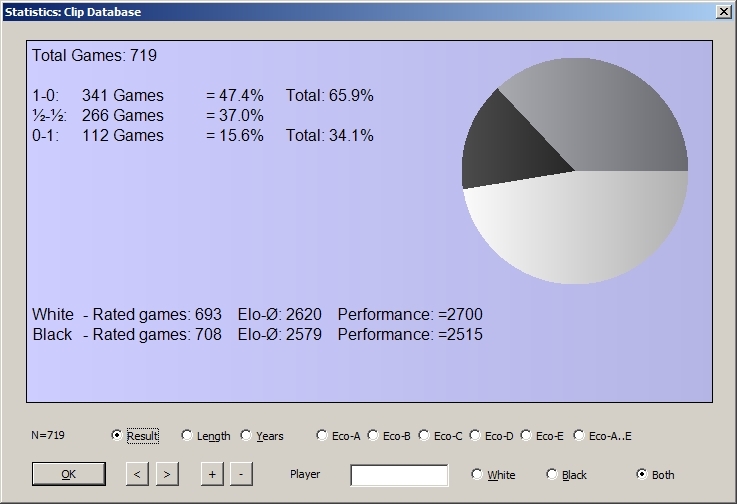 We see exact numbers for White wins, Black wins, and draws (plus the percentage of the total sample of 719 games which each category represents). We also see percentages marked with the word “Total” (and that no such entry appears next to the number of draws). These two numbers show us how Carlsen and his opponents split the total number of available tournament points. As you’re doubtless aware, a full point is awarded for a win in chess tournament and match play (for purposes of determining the winner), while a draw scores a half-point for each player. We can see that of the total “pool” of 719 points available in these games, Carlsen scored 65.9% of the total available points, while his opponents pocketed the remaining 34.1% of them. Therefore if we’re after a straight percentage breakdown of wins, losses, and draws, we’d use the values on the left, while if we want a percentage breakdown of the available points scored, we’d use the “Total” numbers on the right. The numbers for White and Black near the bottom of this display show us the total number of games in which a rating is available for the player of the White pieces (in this case, Carlsen), as well as for the players of the Black pieces. The rest is simple math, in which this display shows the average rating for Carlsen as White (as well as his opponents as Black), and the performance ratings for each. Stay up to date with USCF Sales by following us on Twitter!